While the problem of rural electrification continues to baffle us, a silent progress has been taking place in different parts of India and, in particular, in West Bengal. 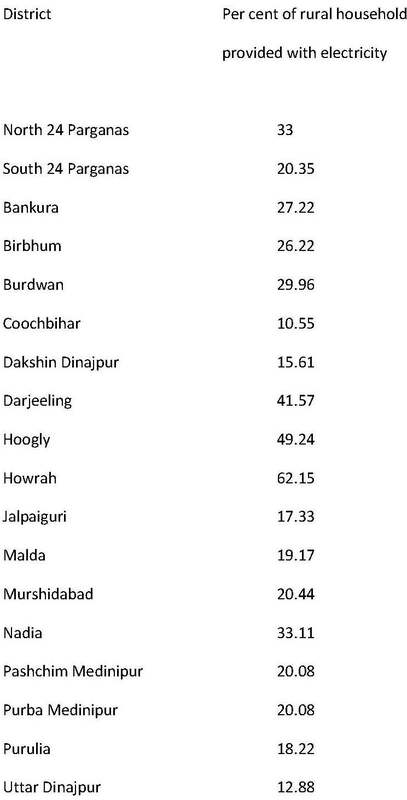 Before I reveal to you what the nature of this progress is, here are some district wise details concerning the state of electrification of rural households in West Bengal. Some may not be concerned about this and I have no quarrel with them. However, I do think these figures indicate that something is totally wrong with the decibel level of our economic growth anthem. Crores of village children have no access to clean light sources during the night. They use kerosene lamps to acquire whatever dismal education our society offers them. These lamps are not environmentally friendly and are definitely a health hazard for the little kids. 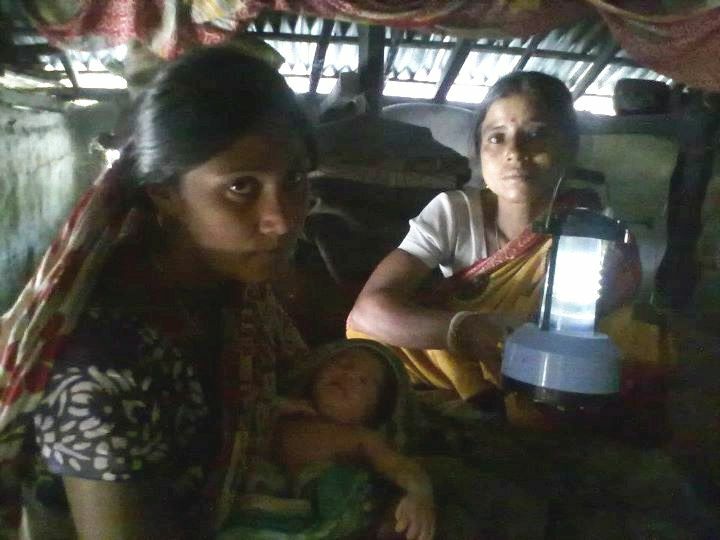 “This lantern was supplied by FREED at Jamespur, Sunderbans and donated by Sulekha Solar. Here is a photograph of that life saving lantern! And the baby too!!!!!!!!!!!!!! It is a relatively easy task it would seem to electrify villages. We don’t need large plots of land to set up thermal power plants. Instead, a simple solar panel in every household will take us a long way. And happily enough, some entrepreneurs are producing these. The one in the picture costs around Rs. 2,000. Shouldn’t it make us think? A pollution free device with zero running cost is already available. Yet the powers that be are negotiating with BIG investors to build power plants. Power plants are a necessity for sure, but not for carrying electricity to rural households. And, incidentally, a small businessman is running a xerox machine in the Sunderban area with the help of solar energy! “Season’s greetings and wishes for a healthy, happy and successful 2012 from Light a Lamp team! While lamps were ordered a few weeks ago, transportation of these lamps was delayed due to paperwork related requirements. We have since been able to complete various formalities (with local sales tax department) and lamps have finally reached Sambalpur from where they will travel further to Bolangir for distribution. However schools are now closed for winter vacations and we hope to start the distribution post January 5th. Estimating 2 weeks for distribution, we hope to complete the project by end-Jan 2012. Thank you for your patience and we look forward to updating you in January of distribution being completed. Friends, I thought I should keep you informed that all’s not for the worst in this worst of all possible worlds!